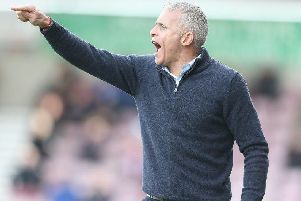 Cobblers defender Ash Taylor insists he’s unfazed by the loss of the captaincy after manager Keith Curle passed the armband over to Aaron Pierre. The captaincy has alternated between Taylor and David Buchanan for much of the season, with the former starting out as skipper under Dean Austin before injury struck in October and Buchanan took over. I consider myself a leader in the team so it won’t change how I play or how I Buchs plays because we’re all leaders in the dressing room. But with neither player starting against Carlisle United last month, Curle chose Pierre, who’s made more league appearances than any other outfield player this season, as the man to lead the side out. And the former Wycombe man kept hold of the armband despite the presence of both Taylor and Buchanan in the team in recent weeks, with all three players starting Town’s most recent game at Tranmere Rovers on Tuesday. “It’s a situation with the gaffer and it’s his decision,” said Taylor. “It’s one of those where we need to discuss it but it’s only an armband at the end of the day. “I consider myself a leader in the team so it won’t change how I play or how Buchs plays because we’re all leaders in the dressing room. “If it helps Pierre in his game then that’s good and I think it has helped him because he’s a lot more vocal now and he’s coming out of his shell a lot more. “I was captain at Tranmere as a young lad and it’s always been in me to be that presence and be that influence in the dressing room so it won’t change how I player or how anyone else plays. Taylor’s future with the Cobblers has been the source of speculation during the past two transfer windows, particularly in the summer after he won the club’s Player of the Season award last season. But with another year left on his contract, he remains committed to the club. He said: “I’ve got another year and it’ll be up the manager as to what he wants to do.